The classical scholar and tutor Miriam Griffin, who has died aged 82, played a crucial role in getting readers to appreciate the philosophical writing of the ancient Romans in their historical context, in particular that of Seneca, the Stoic philosopher and tutor to the emperor Nero. The scholar who rescued the philosophical reputation of Seneca (and Cicero), as she illuminated the often torrid world of Roman imperial politics: Miriam Griffin. As we note that too often what’s past is present again, we might think of Seneca’s challenge as we recall that it was on this date in 1859 that Charles Blondin crossed Niagara Falls on a tightrope. Twice. On the morning of June 30, 1859, about 25,000 thrill-seekers arrived by train and steamer and dispersed on the American or Canadian side of the falls, the latter said to have the better view. Both banks grew “fairly black” with swarms of spectators, among them statesmen, judges, clerics, generals, members of Congress, capitalists, artists, newspaper editors, professors, debutantes, salesmen and hucksters. Vendors hawked everything from lemonade to whiskey, and Colcord gave tours to the press, explaining the logistics of what the Great Blondin was about to attempt. A light rope, not even an inch thick, had been attached to one end of his hempen cable so it could be conveyed across the Niagara River. On the American side the cable was wound around the trunk of an oak tree in White’s Pleasure Grounds, but securing it on the Canadian side presented a problem. Blondin’s assistants feared that the light rope wouldn’t bear the weight of the cable as it was drawn up the gorge for anchorage in Canada, but the rope dancer, to the delight of his audience, executed a daring solution. As we think in time, we might recall that it was on this date in 44 BCE that Cicero delivered the first of his oratorical attacks, Philippicae, on Mark Antony. He went on to make 14 of them over the next several months. Modeled on Demosthenes‘ Philippic (Ad Atticus, 2.1.3, leveled by the Greek orator against Philip of Macedon), the Philippicae attacked Antony both for his leadership in Julius Caesar’s assassination and for other offenses against the realm. 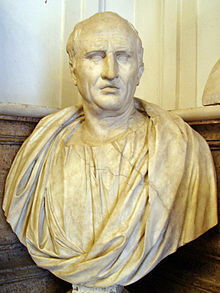 While Cicero had been sympathetic with the conspirators who acted on the Ides of March, he favored Julius’ adopted son and heir, Octavian as the next leader. While Octavian ultimately prevailed, Cicero’s effort to force out Antony failed. Octavian, Antony, and Lepidus formed a Triumvirate to rule; and Cicero was “proscribed”– made an enemy of the state. He fled, but was captured and ultimately beheaded. Antony requested that the hands that wrote the Philippics also be removed; his head and hands were publicly displayed in the Roman Forum to discourage any who would oppose the new Triumvirate. While popularised by Guillaume Apollinaire’s wonderful Calligrammes from 1918, the art of making images through the novel arrangement of words upon the page can be traced back many centuries. 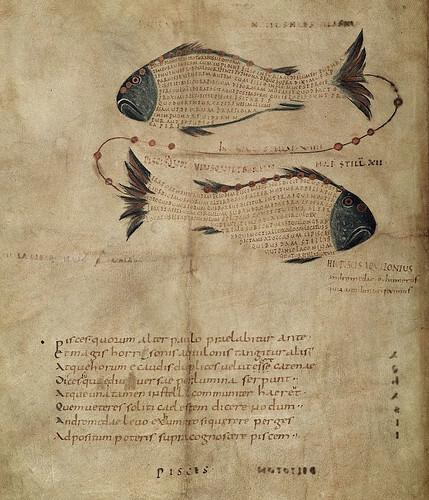 Some of the earliest examples of these “calligrams” are to be found in a marvellous 9th-century manuscript known as the Aratea. Each page of the Aratea has a poem on the bottom half — written by the 3rd-century BC Greek poet Aratus and translated into Latin by a young Cicero — describing an astronomical constellation. This constellation is then beautifully drawn above the poetry; the drawings however are themselves made up of words taken from Hyginus’ Astronomica. The passages used to form the images describe the constellation which they create on the page, and in this way they become tied to one another: neither the words or images would make full sense without the other there to complete the scene. Also, note the red dots on each picture: these show where the stars appear in the sky. This remarkable object brings together nearly 2000 years of cultural history. Making use of two Roman texts on astronomy written in the 1st century BC, the manuscript was created in Northern France in about 820. It then found its way into the library of the Harley family in England, before being sold to the nation in 1752 under the same Act of Parliament which created the British Museum. 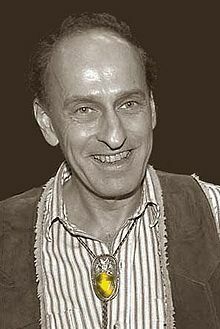 As we “just doodle it,” we might send speculative birthday greetings to Roger Joseph Zelazny; he was born on this date in 1937. While (justly) remembered as an important science fiction author— he won the Hugo Award six times; the Nebula, three– he was also an accomplished poet. 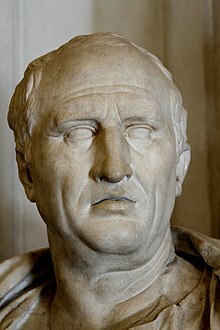 As we find our inner stillness, we might recall that it was on this date in 43 BCE that Rome’s greatest orator, Marcus Tullius Cicero was executed (his head and hands were amputated) for his Philippics, a series of speeches attacking Mark Antony and calling for a restoration of the Republic. Sic semper prōtestor.